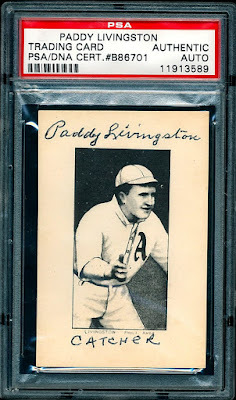 In November 2013, Heritage held the largest signed T206 card collection auction in seven years. 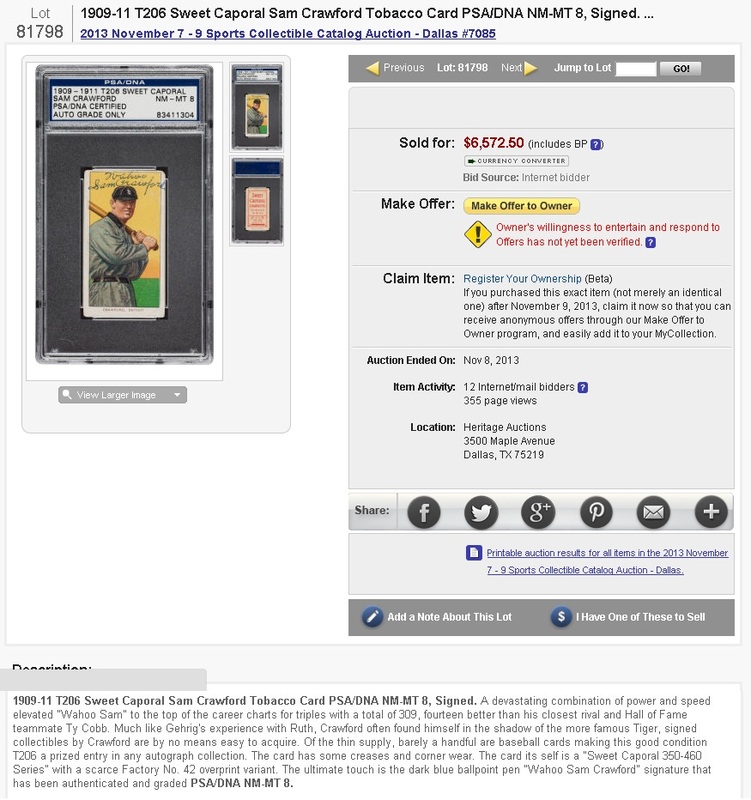 Not only did this auction feature the first offer of a signed T206 Rucker Throwing in over at least a dozen years, but the prices realized were more or less astronomical, when compared with the most recent public sales of many of these cards. Ironically, not a single Marquard was available! However, the other "usual suspects" Doyle and Snodgrass were featured. For collectors looking to add HOFers, you had three to pick from -- Flick, Wheat and Crawford. And the prices realized for those were Hall of Fame caliber to be sure. I was focused on the Rucker, as it was the only one I didn't own. But the Leach is also ultra-rare. Just a fantastic collection of beautifully autographed and preserved T206 cards. I am thrilled to add my first unique pose T206 in over a year -- introducing Nap Rucker! This brings my total of unique signed T206 poses to an even 40 (provided you count Mrs. Jane Mathewson & Mrs. Blanche McGraw). Someone else figured out that this one is extremely rare and really let me have it in the bidding. I am also extremely excited to add an authentic Eddie Cicotte signed T205 to my collection. Sure, I'd love a T206, but this was too precious to pass up. So, in one night I was able to add a signature that I did not own before, and a signed T206 that I did not own before. I am very pleased! Thanks to whoever the consignor of these beauties is -- I'd sure love to know who had the forethought to get all these signatures on pre-war cards! They deserve all the credit. How Many Signed T206 Cards Exist? I often get questions of how many different signed T206 poses do I estimate are in existence. As of this writing, I own 39 different poses, if you count Mrs. Blanche McGraw and Mrs. Jane Mathewson on their husbands' respective cards, 37 otherwise. In addition to these, I have seen scans of the following seven (7) additional poses from Jeff Morey's collection: Bush Cravath Lobert Zimmerman Wiltse (Portrait No Cap) Rucker (Throwing) Cobb (Green Portrait) And I have seen credible proof of the following 10 additional poses: Cobb (Portrait Green) Cobb (Bat On) Cicotte Lajoie (Batting) Clarke (Portrait) Walsh Phillippe Chance Speaker Bresnahan (Batting) So that's at least 54 different T206s signed by their subjects. I have heard claims about Stanage, Moriarty, and Schmidt signed poses from a Net54 collector, but I have never seen a copy or scan, so it is hard to fully credit the representation. Other collectors own T206s that are purportedly signed by McGraw, Jennings, and Bender -- but I don't think any of these have been authenticated by JSA or PSA/DNA or another respected third-party authenticator. Renowned autograph dealer Phil Marks says that a bunch of signed T206 Bresnahans exist in private collections, but I have only seen the one batting pose that has been shared here a few times. I have never seen another, or the portrait pose. Shaw and Pattee lived into the 1970s -- in fact Shaw was the 3rd-to-last T206er to pass away, survived only by Livingston and Marquard -- and should thus be reasonably possible. But, I've never seen a scan. So, I would guess conservatively that maybe 60 or so exist in total. I could buy into a more aggressive theory that maybe as many as 70 exist. But, I would bet the under on 75. Since the advent of scanned online auction images in the major auction houses over a decade ago there have been no other sightings than are either in my collection or listed in this post. Still, it is exciting to imagine what could be out there lurking in private collections. In the only email I have ever gotten from Keith Olberman he told me that he had about 25. But, he never responded to my follow-up email about which ones he had. If only all collectors of signed T206 cards would post scans of their treasures, the world would be a better place for us all! This 1914 T222 Fatima Cigarettes card of Amos Strunk was signed in blue steel tip pen. 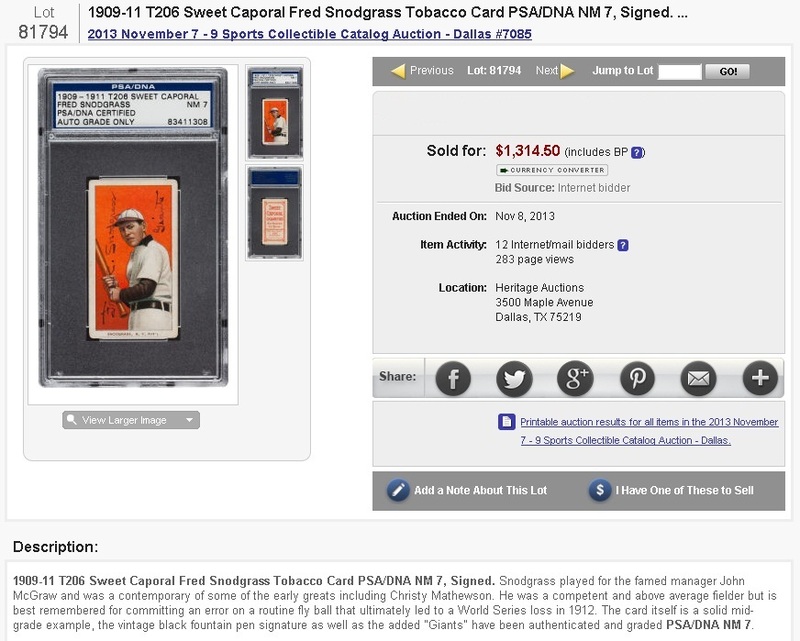 Authenticated by PSA/DNA, this card was part of Collect Auctions August 9th sale. Okay, can someone PLEASE tell me what the heck happened here? If I am correct, this is the first time in history that a signed Marquard has ever sold for over $1,000 -- let alone $1,200 -- without a Hindu reverse. Of course, it is nice to see signed T206 cards get this kind of respect in the market... but it also makes my plans to hoard them a little more tenuous! I dropped out of this one when the bidding hit $750. With buyer's premium, this beauty went for $1,266.15!! Perhaps once people realized how cool and rare signed T206 cards are, this sort of price inflation was bound to happen. Apparently, the same thing is happening in the market for T206 miscuts and errors. I really love to share my collection online at Net54baseball.com and on my website. On the upside, it helps me find signed T206s that I might want to acquire. On the downside, collectors learn more about this little niche of collecting and demand goes up. While as a potential future seller I would like to think signed T206 Marquards are worth over $1,000, as a current prospective buyer I am going to keep my fingers crossed that this was an aberration! Grading is a pyramid. At the top, you have the 10s. 10 means perfection and thus all 10s will be identical. As you go down the pyramid, grades are set for a variety of reasons -- 9s almost all look the same, but 3s, 2s and 1s have a huge number of potential flaws, including paper loss on reverse, creasing, corner wear, etc. 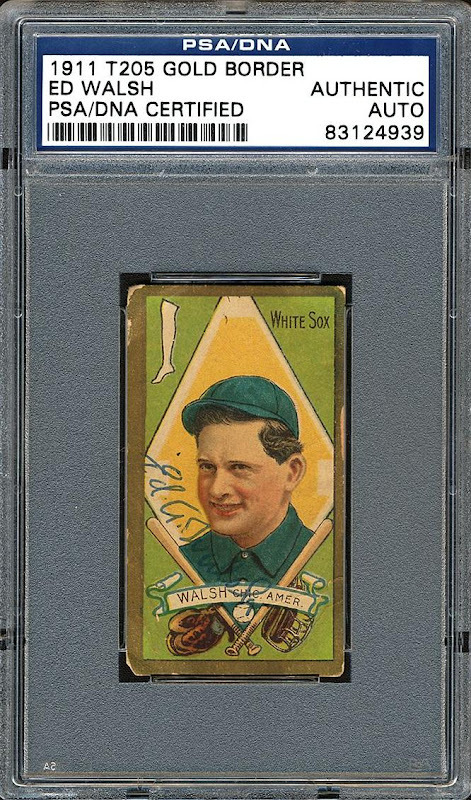 What makes a card an SGC 30 could be a variety of factors that tell you nothing about the eye appeal of the card without looking at it. Professional grading is not designed to reflect eye appeal. It is designed to point out flaws, often hard to see or hidden, in a piece of card board. When you see a clean-looking SGC 30, you actually know there are a lot of hard to see flaws. When you see a badgered up SGC 30, what you see is what you get. But not all SGC 30s will look alike -- in fact, at that level of the "pyramid" you will have a lot of different looking cards. This becomes problematic when sellers try to sell a PSA 2 for what a previous PSA 2 sold for. Without comparing both cards, going by the number alone gets you nowhere because what you don't know about the previous card is whether the damage was similar or whether the eye-appeal was comparable. Sometimes you can get a pretty good deal on a nice looking 2 when a seller is willing to use a previous ugly 2 as a comparable. This is why they say, "Buy the card, not the holder." Picked up another Marquard a coupla weeks ago. Here's my current collection of signed T206 Marquards. Sometimes people will ask me how rare these really are, and I say, "Well, if I've got 8 of them, how rare can they really be? How many more must be out there?" Heck, I've owned maybe a half dozen other signed T206 Marquards that aren't even among this 8! If you're going to keep special cards under lock and key for a generation, you owe it to the collecting public to at least let them breathe online. 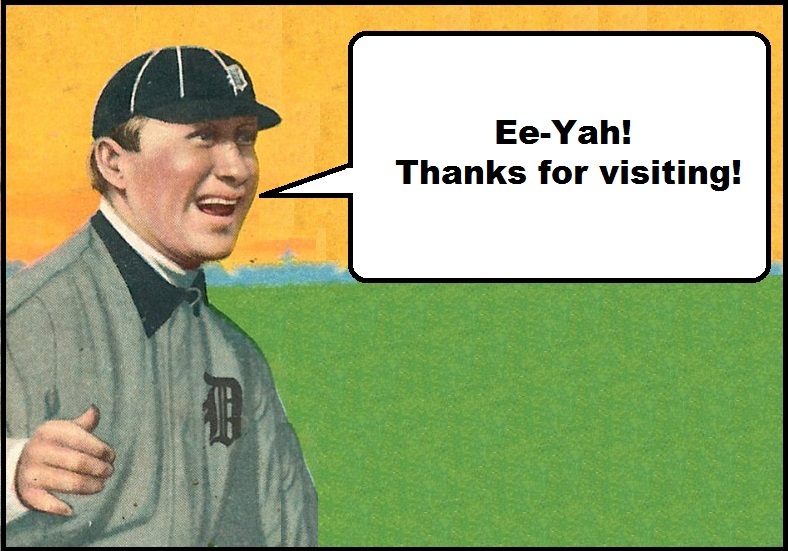 Collectors of pre-war cards are only holding our cards in a sort of collective public trust. Sharing cards not only increases personal enjoyment, but it inspires collections. People complain that kids today don't collect baseball cards. Today's collectors share responsibility for passing on the enjoyment to the next generation. Not only does this make sense economically when you go to sell, but it makes at least me feel better when I realize I can't take these with me. Moreover, sharing cards on my website has brought so many collectors to my attention, including like-minded folk with similar collecting interestes. In short, share your images! My endless pursuit of autographed T206 cards often forces me to buy cards that have not been authenticated. Frequently, a signature is convincing, even though I am unable to find any examples of the signature against which to compare it. And the seller isn't making forgeries, he's just selling a card that has definitely been signed by someone -- perhaps even the player himself. The problem is, not only can't I find an exemplar -- neither can PSA/DNA or JSA. In fact, the sad truth is, some signatures are so obscure that even if they were genuine, the experts can't confirm it or deny it. They can only tell you the factors that suggest it could be real, and the reasons they think it might be fake. The three examples below fall into this category. I absolutely love the Frank Smith, which has been artfully signed in white by someone with a smooth hand. James Spence took a picture for his files, but had nothing against which to compare it. Maybe one day, an identifying exemplar of Smith's will turn up and uncover whether this is the genuine article or not. The McElveen is an ugly card with an interesting signature. It doesn't have the traditional hallmarks of a fake, as it is small and unassuming. However, given that McElveen died in 1951, this gave McElveen precious few years to sign T206 cards in ballpoint - as this one was - since ballpoint pens only came into vogue shortly after World War II. PSA/DNA found the signature to have questionable authenticity, and JSA couldn't authenticate it either. The reason? Again, nothing against which to compare it. Finally, good old Gus Dorner. This one is pretty clearly just an identifying mark of a collector, who wanted for some reason to put the player's full name on the back of his card in pencil. However, if it were real, we wouldn't be able to authenticate it -- this is a Minor League card of a player who played sporadically in the Majors only through 1909. Again, no exemplars available. So what do you do when you come across signed cards that can't be authenticated by anyone? If a player signed few autographs during his lifetime, that makes them rare -- and valuable, but only if the signature can be confirmed as real. Ironically, the rarer the signature, the less valuable it can become. If there's only one -- and there were no witnesses -- then how do you know it is real at all? For the past decade or so, my mother always gets me the Cooperstown Calendar (among other things) as a Christmas present. 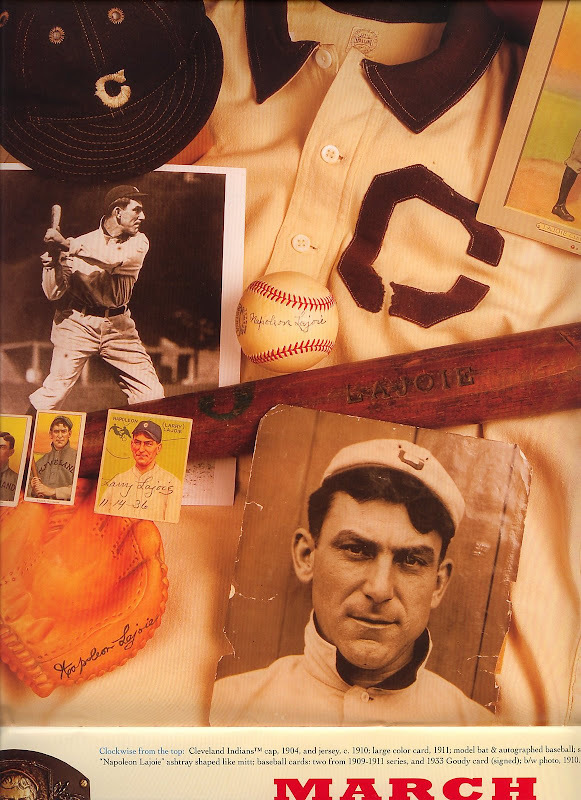 Imagine my shock and awe when I looked at March and saw an autographed 1933 Goudey Lajoie in the display. 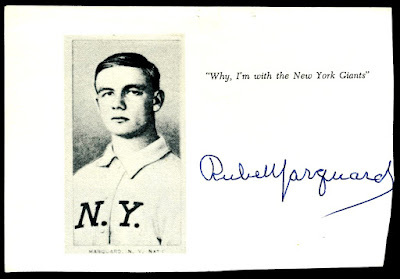 This has got to be the ultimate autographed pre-war auto -- beatable only by a signed T206 Wagner or T206 Plank. Obviously, it is hidden away from all collectors -- totally unobtainable -- and I would bet there is not another. How many collections are incomplete without this one? Autographed pre-war card collections? Signed HOF card collections? Lajoie collections? Simply an amazing card. I just received a scan of a terrific letter from Larry Ritter to autograph legend Jeff Morey, essentially crediting Morey for helping him locate some players. I always had a theory that Ritter's book should be credited for getting the names of pre-war players into the minds of autograph seekers in the 1960s and 1970s. It is amazing to see that the autograph seekers themselves had a hand in Ritter's work. Here's one of my favorite signed T206 cards from the Morey collection (Crawford -- who was also in Ritter's book), as well as a scan of the letter from Ritter to Morey. 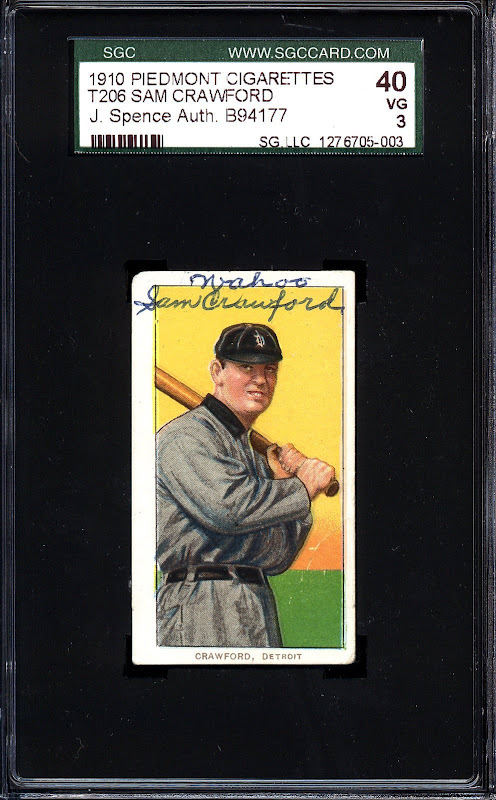 If anyone wants to go in for the T205 set in Heritage Auctions, I would be a more than happy bidding partner -- and all I'd want would be the signed Marquard and Wheat that found their way into this collection. Email me at SignedT206@gmail.com if you'd like some serious help bidding! ...onto the MiniSD card. Now, when I open the photo album, I can literally flip through my entire collection with my finger, at a faster speed than if I had a stack of T206 cards in my hand. And I do not even need to flip the cards over to see the backs, because the backs are side-by-side with the fronts. Also, the resolution is so good that I can "pinch" the screen in order to magnify the images and see the subtle flaws as well as beauty of each individual card. I have to say, this technology has really improved my enjoyment of my collection. If nothing else, I was able to bring my BlackBerry to the East Coast National card show this past weekend so that I could see whether I needed certain T206 cards and whether the cards available would be upgrades for me. ...run up the mountain that is the Monster. (Borrowing from the name of the Metallica documentary, I refer to my latest collection as Some Kind Of Monster.) The first time around, I was condition conscious and went after some really nice examples of Hall of Famers. But this time, I am pushing for quantity over quality. And I could really care less about condition. But even so, I often accidentally fall into really nice VG-EX cards that are being lumped in with the beaters, and for hardly any additional cash whatsoever. What has always been daunting to me is the sheer quantity of cards required for completion. But when you eschew quality of cardboard and player, the quantity part takes care of itself pretty quickly. In a few months of trolling the B/S/T threads on Net54baseball.com and an occasional hit on ebay, I have managed to accrue about 300 new T206 cards, virtually all for under $20 -- and many for less than $15 or even $10. Indeed, I am now less than 200 cards from completion. While I need almost all the HOFers and Southern Leaguers, I only need just about 70 commons now. When I get those knocked off, then the Monster will become a much more manageable beast. While it is certainly fun to collect HOFers, they are a slower collection. Given that patience has never been one of my strong suits, I think going the commons route has really helped me this time around, because I can see quicker progress. Also, one of the things that makes collecting T206 so hard is the constant temptation to sell. If you've got a few mid-grade HOFers, they are easy to sell for $100+ as singles. But low-grade commons take a lot more effort to part with and the return is obviously much, much lower. My low-grade T206 commons collection actually makes it harder to just cut bait. It creates its own disincentive to sell. The Monster may want me to quit, to be sure, but it hardly cares for my approach here either. In this way, I sort of feel like I am sneaking up on the Monster. In a few acquisitions, I'm sure he'll turn around -- "What?! You again, eh?!" -- but for the time being, he sits silently, unconcerned that I am anywhere nearing completion. I have him right where I want him!! "Where is our boy ? Ah, we've lost our boy"
Unfortunately, I will not be going to the National. But if anyone there sees any pre-WW I autographed cards, please be sure to let me know about it!! In any event, I count at least 32 T205ers not in T206. Seems to me that many of these players were already established by or in the period of the T206 run (1909-11), e.g., Leever and Wolter. And clearly each was either willing or did not successfully object to his appearance on a tobacco card. 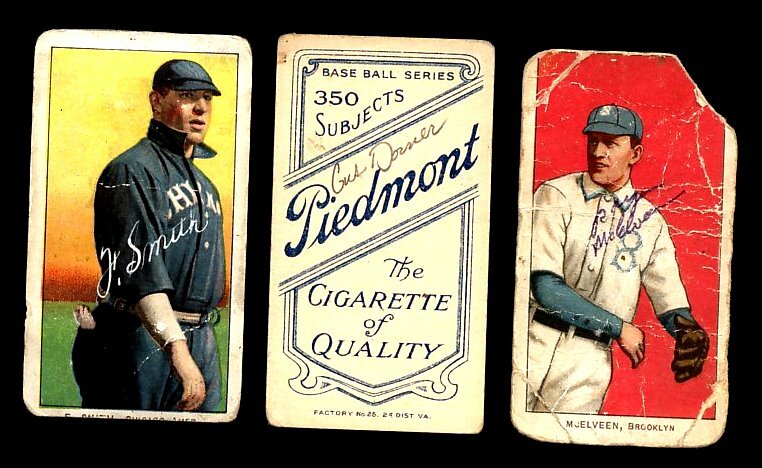 So how'd they get their mugs on T205 but not T206 -- especially if T206s were issued in 1911 along with their T205 counterpart? Obviously, the number of players in T205 was significantly limited in comparison to the T206 set. So why would approximately 1/6 of the T205 set contain entirely new players? The obvious explanations would be a combination of (a) expired/new player licenses; with (b) declining/emerging talent.